As I studied the menu at one of my favorite breakfast spots in Chicago this past weekend, I noticed polenta cakes advertised as pancakes. To give you a look into how my mind works, that reminded me of the polenta in my cabinet, which led to a sudden urge to make polenta…into little cakes. I have no idea what the polenta cakes on the menu looked like because I go with eggs in the morning, but I am sure they would have been spectacular. You know when you don’t get something you may have wanted and that causes you to obsess over it? That is where I was. Obsessing over polenta cakes. I opened my fridge a day later (polenta cakes creeping to the extreme forefront of my mind) to see a quart of grape tomatoes starting to wrinkle. I immediately pulled them out, attempting to rescue them. 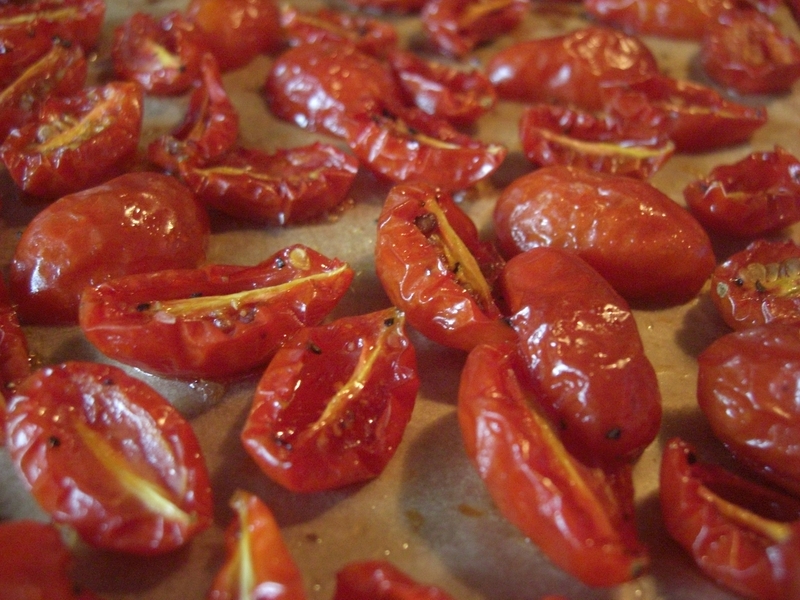 I’d never roasted tomatoes, but knew it was not hard and could possibly make a perfect addition to a polenta cake. Halved, doused in olive oil, salted and peppered and into the oven they went at 325 degrees for 2 1/2 hours (they were small grape tomatoes and didn’t need a full 3 hours to roast). Since obsession was the theme, I remembered my summer-into-fall love affair with ricotta. I had found tubs of the fresh kind at Whole Foods and used it in several recipes. They became another ingredient for the polenta cakes. Basil was an easy last addition since it goes with the flavors. Together, all these pieces create polenta cakes with roasted tomatoes, perfect as an appetizer…when the need to make polenta comes about. Pre-heat oven to 350 degrees. Spray or grease an 8″ or 9″ round cake pan. If desired, line with parchement paper. Bring chicken broth to a simmer in a medium saucepan. Add pinch of salt and polenta. Stir gently until polenta begins to come away from sides of pan. Add parmesan cheese and garlic powder, stir to mix. Remove from heat. Pour polenta into cake pan and bake at 350 degrees for about 15 to 20 minutes, or until top is set. Remove from oven and let cool slightly. 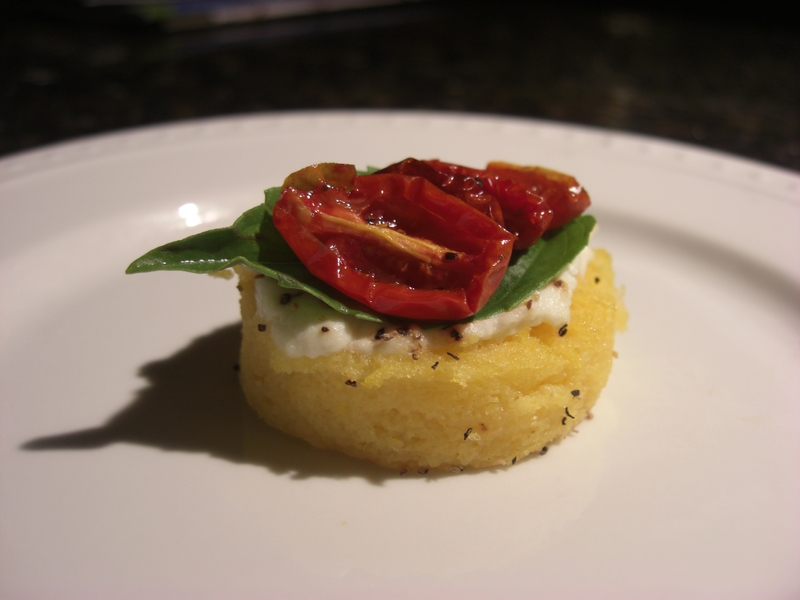 Turn polenta cake onto a plate, remove parchement from bottom. Using a 1 inch diameter biscuit cutter, cut polenta cake into mini cakes. While polenta cake is baking, mix ricotta with salt and pepper to taste. I use about 1 teaspoon salt and a few grinds of pepper. 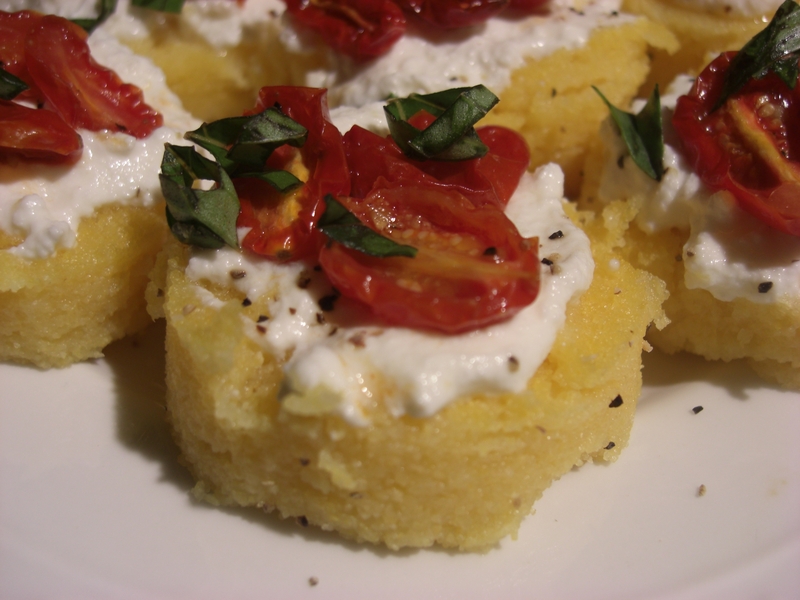 Top cooled polenta cakes with about 1 or 2 teaspoons ricotta. Top with a basil leaf and three or four tomato halves. Alternatively, top ricotta with three or four roasted tomato halves and basil chiffonade (when the basil is cut into long thin strips), or as I like to call it “basil confetti”. Season with salt and pepper again if desired. I prefer these bites at room temperature, but chilled is delicious as well. This recipe can be played with and I want to try topping the polenta cakes with mozzerella chunks then the tomatoes, or fresh tomatoes, maybe some fresh salmon and dill, perhaps some roasted vegetable layers…I’m getting too many ideas and I’ll have to post them once they finally take shape! In polenta cake form of course. folks you eally recognise what you’re speaking about! Generally I don’t read article on blogs, however I would like to say that this write-up very compelled me to try and do so!